You know what they say about getting an up-close look at zombies? Do it from as far away as possible. You never want to be close to zombies, and you want to be sure you can tell if they’re coming from a long way away. The best way to get a good, long range view of zombies (other than from the space station) is to have a good set of compact and durable binoculars. Binoculars work by magnifying images through a series of lenses that allow your eyes to see further than would humanly be possible. This becomes highly advantageous when you’re scoping out an approaching horde of zombie marauders. You don’t want to have to get right on top of their position to scout it out, right? Of course you don’t. That’s why you pack a nice pair of compact binoculars to safely see what’s coming long before it can see you. 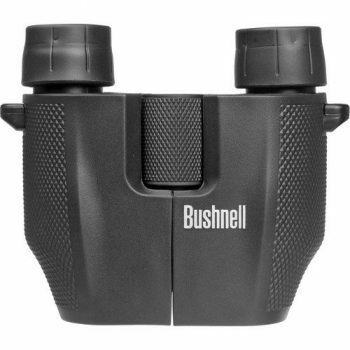 This is a great little set of binoculars with a big magnification capability. The Powerview 8x25 utilizes numerous lens coatings to give you unsurpassed clarity and resolution. One interesting thing about binocular magnification is that images viewed with it without manipulation will appear upside down to the viewer. This is due to the refractive properties of the magnifying lens. The Porro Prism system utilized in t he Busnell Powerview effectively “flips” the image to it’s right-side up position before the light reaches your eyes. This saves you, the viewer, the trouble of having to hang upside down to get a right side up view of your query!! The Powerview also comes equipped with a shock absorbing, slip-resistant outer coating which is sure to stay in the hands of even the clumsiest of scouts. When you combine those features with the 8x magnification lens, you’ve got yourself a dynamic and durable, powerful little piece of long-range surveillance technology.